In the midst of the recent rancour and controversy in the relationship between African Union (AU) member states and the International Criminal Court (ICC), it was all too easy to forget that one state decided to take a rather valiant stand. 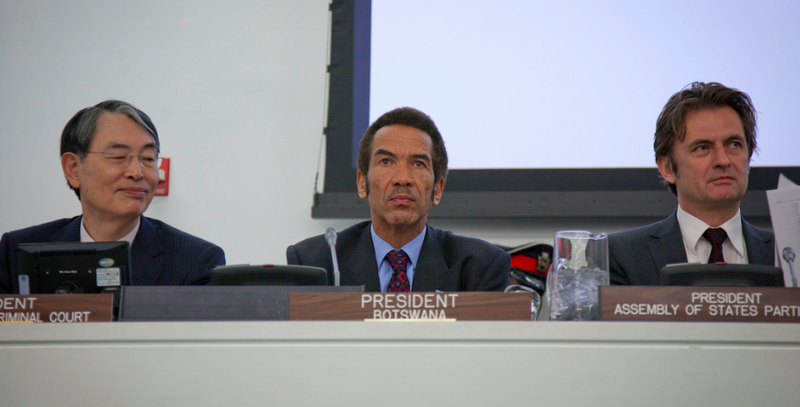 When the African Union recently passed a resolution calling into question the conduct of the ICC and claiming that it had unfairly targeted African leaders, the sub-Saharan nation of Botswana decided it wasn’t having any of it. If you read the AU resolution, you’ll notice that it includes a single footnote which reads: “The Reservation of the Republic of Botswana on the entire decision was entered.” But for that small footnote marring the title of the Resolution, the AU’s anti-ICC pact is otherwise pristine. For those who follow baseball, the footnote is akin to the asterisk hanging over the names of players whose records are tainted by steroid use – except that, in this case, the asterisk denotes courage not cowardice. Sadly, it was only Botswana that decided to take a stand against the AU Resolution. It came as a disappointment that other state which had previously engaged the ICC and supported its work, including Ivory Coast and South Africa, threw their weight behind the Resolution. Even The Gambia, which reportedly considered voting against the Resolution out of support for the ICC’s Gambian Chief Prosecutor Fatou Bensouda, sided with the AU. So why did Botswana do it? In the above video, Botswana’s ambassador to Kenya, John Moreti states clearly that his country’s decision had nothing to do with the Botswana’s position towards Kenyan President Uhuro Kenyatta or Vice President William Ruto, both of whom face charges at the ICC stemming from Kenya’s 2007/08 post-election violence. Instead, Moreti suggested that the AU’s Resolution was an unhelpful and deleterious political move that would only antagonize the Court and pull the African hinder improved relations with the international community. He added that he thought there was “no problem with the Court” and that any dislike of the Prosecutor did not amount to dislike for the Court itself. What is so remarkable about Botswana’s dissent is that there is no evidence that it stemmed from any realpolitik calculation. Sure, Botswana will (and has) reaped praise for its commitment to the ICC and its decision to vote against the Resolution will undoubtedly boost its reputation in human rights and international justice sectors. But how much is a high-five from Human Rights Watch worth in comparison to the potential political and economic costs of being the sole voice opposing the African Union? To be sure, Botswana surely faces some very unhappy leaders on the continent. Of course, there is a risk in being too state-centric here. Botswana is not “alone” in its stance against the African Union. It is quite clear that millions of African citizens support the ICC and international criminal justice – even if it hasn’t always lived up to their expectations. The Kenyan news report presents Botswana as “Africa’s renegade nation”. But Botswana’s decision to stand alone in the face of the AU’s anti-ICC rhetoric shouldn’t be derided. It is remarkable and praiseworthy. If there was an ICC member-state of the year award, Botswana would be a front-runner. This entry was posted in African Union (AU), Botswana, International Criminal Court (ICC), Kenya, Kenya and the ICC. Bookmark the permalink. It is not surprising that Botswana supports the ICC, itself a western imperialist institution for intimidation and blackmail, precisely because the west has it by the short hairs through their control of Botswana’s diamond mine industry and which contributes 50% of Botswana’s revenues – an industry controlled by just one company, Debswana, and which is a subsidiary of British multinational Anglo-American. It is not even surprising that Botswana and President Khama were willing to host AFRICOM, the US military command for Africa suspected by African nations as intended for imperialist conquest, until South Africa and even Botswanans expressed strong opposition and threatened to close the border and enforce an air blockade http://www.africareview.com/News/Botswana-warned-over-Africom-ties/-/979180/1483434/-/kgv4if/-/index.html an action that would have effectively isolated Botswana as it is landlocked and depends for all its exports and imports on South African ports. Botswana is thus in no position to defy western institutions as they can bring down the Govt at any time. You do not bite the hand that feeds you. I certainly do not wish to detract from Botswana’s noble position, but it might also be worthwhile to note that the Vice President of the Court, Judge Sanji Monageng happens to be from Botswana. One could just as easily argue that Botswana is a coward in hock to the international justice community’s money and a traitor to its African brethren. The debate on Africa and the ICC is already very emotional, so it might be better to just leave aside such charged statements (just to clarify, I don’t think Botswana is a coward or a traitor – I was just illustrating a point). It’s just a thought, especially since you are representing the scholarly community, which probably has more of a responsibility to objectivity and rationality than most other communities involved in the ICC-Africa debate. I also think it’s worth pointing out that this month Botswana became the first African state to ratify both amendments to the Rome Statute. So, Botswana is scared of the West? Is that so?? Before spewing more propaganda, let us get a few things straight. Botswana has one of the best run economies in Africa, their foreign debt (aka aid) is negligible and they have Foreign currency reserves in excess of $7 billion. So, as things are they are in less need of the “Western imperialists” than our own Kenya. Their stance on the ICC and the mis-ruling elite of Africa has been remarkably consistent and they are a major employment market for our own Kenyan professionals. The ICC conundrum currently facing Kenya was of its own making. The local mechanism to try PEV suspects was debated in Kenya’s parliament on 2 different occasions, the smart arses in parliament decided to reject the local mechanism. It is all there in the parliamentary hansard if you are at all interested in it. The current governing duo were explicitly pro ICC, I don’t have to remind you of the “Let us not be vague, let us go to the Hague” malarkey. So rather than wasting your time vilifying Botswana, who are a middle income country and don’t need the “Western imperialists” to support their economy as much as Kenya does (with its shameful budget deficit that will be largely funded by the “pesky West”), why don’t you tell us how we got there in the first place? Kenya was warned of all that is happening at the ICC beforehand. Kenya was not forced to adopt the Rome statute and it is not the Western imperialists who domesticated the Rome statute in the Kenyan parliament. Africans are always victims – from the days of slave trade, colonialism until now. The question is why? If we answered this truthfully, we would put our relations with ICC in the right context.